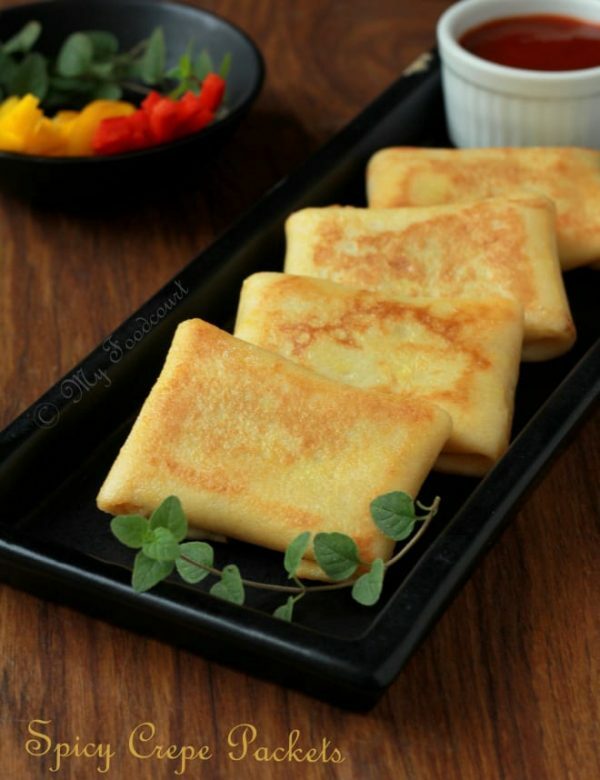 Ruote pasta is popularly known as Cartwheel pasta or Wagon wheel pasta owing to its shape. I was delighted to find this pretty pasta at a local store. 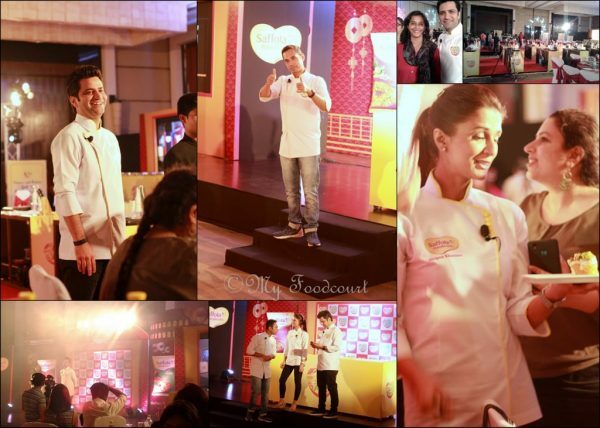 This month Archana’s Kitchen & Del Monte invited home cooks and bloggers to enter their favorite easy-to-prepare Italian recipes to celebrate their love for Italian Cuisine. I made this Ruote pasta & Eggplant gratin for the Del Monte’s ‘Italian Affaire’ recipe contest and I won the first prize! 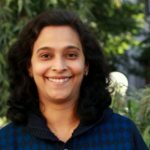 I told you -this year has been really good! 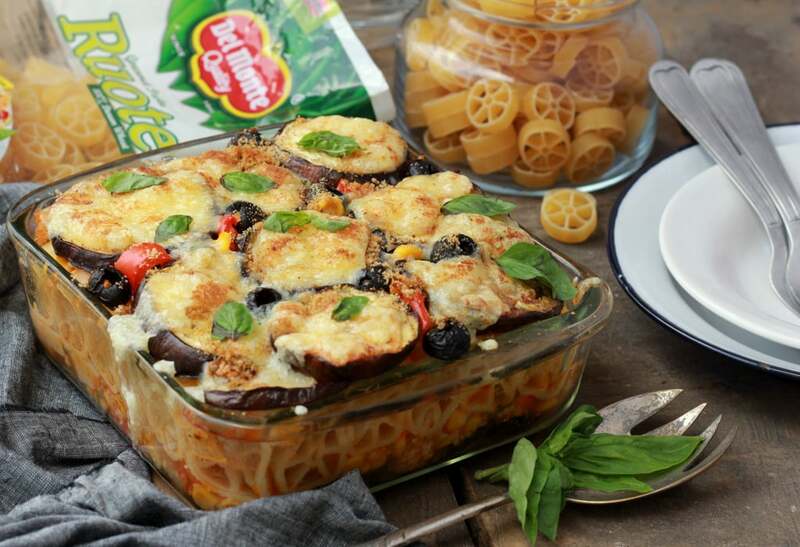 Ruote Pasta & Eggplant Gratin is a scrumptious one pot meal which is sure to please everyone. Got a thumbs up even from the kids even though they are not very fond of eggplants! The pretty pasta is layered with veggies in a pasta sauce, soy granules,eggplants and topped with Gouda cheese; you can also use Mozzarella or Parmesan cheese instead. Use any vegetables of choice or use up leftover vegetables lurking in your fridge. 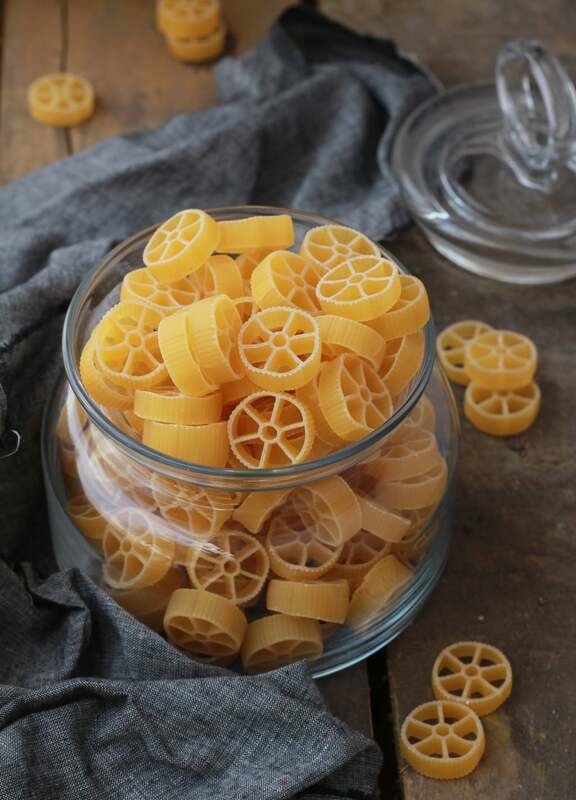 Ruote pasta is popularly known as Cartwheel pasta or Wagon wheel pasta owing to its shape. This Ruote pasta & Eggplant gratin is a scrumptious one pot meal which is sure to please everyone. Boil the pasta in a saucepan of salted water for 7 minutes (or as per package instructions). Do not overcook. Drain the water and rinse the pasta under cold water. Keep aside. 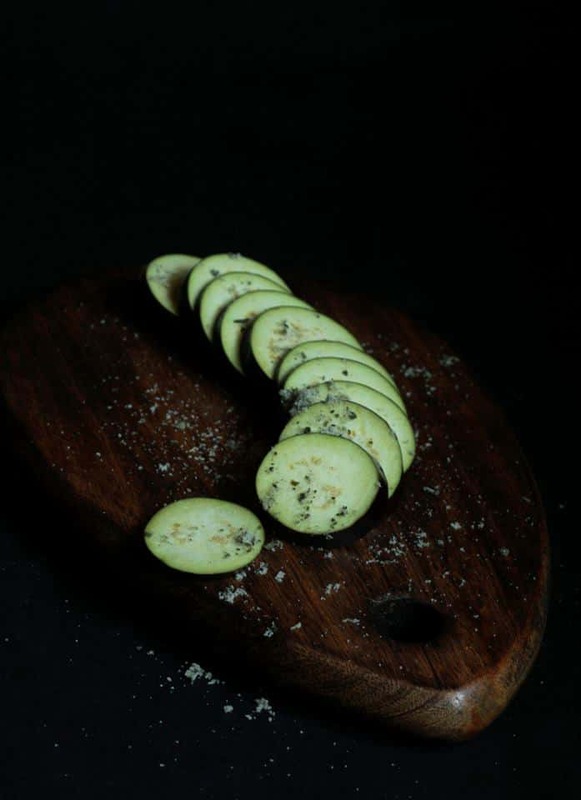 Sprinkle some salt on the eggplant slices and keep aside for 10 minutes. Wash the slices and pat dry using a kitchen towel. Grill the eggplant on a hot grill pan till brown marks appear on both sides and the eggplants become's a little soft. Sprinkle some salt and pepper over them. Keep aside. In a wok/pan add 2 tablespoon olive oil. Add the onion and garlic and sautxe9 till the onion turns translucent. Add the bell pepper and stir-fry for a minute. Add the corn kernels, soy granules, salt as required and mix well. Cook till all the water evaporates. Take it off the heat and mix in the pasta sauce and chili flakes. Add the herbs, reserving some for the garnish. Place some eggplant slices at the base of the baking dish, such that it is covered. Spoon over some of the vegetable sauce and spread evenly. Top with a 1-2 tablespoon of the bread crumbs and half of the cheese. Spread the pasta evenly over it. Spread another layer of the vegetable sauce. Top with the left over eggplant slices and place the olives in between the eggplant slices. Sprinkle the leftover bread crumbs and cheese over them. Bake for about 15-20 minutes till the cheese melts. Garnish with the herbs and serve with some garlic bread.